Epic, Game of Thrones style conflict is the theme on offer on Warlords: Crystals of Power. Created by Net Entertainment, this 5 reel, 30 payline video slot pits The Barbarian, The Priestess and The Samurai into battle and in the process delivers overlay wilds, re-spins and a trio of free spin features with multipliers and sticky wilds. Take to the battlefield from between 15p and £150 per spin. We usually have little to grouse about as far as the design of NetEnt powered video slots and the usual high standards are on show here. 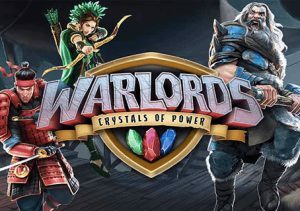 Warlords: Crystals of Power looks terrific as you’d expect – this is a high end, 3D offering with super sharp visuals and a sweeping soundtrack. The reels are set against a battlefield backdrop and feature lower value battle masks, mid-range animal mascots and the Barbarian, Priestess and Samurai. The 3 warlords can all appear stacked and fill the whole reel in which they appear. As well as the standard wild, there are also a trio of overlay wilds that can arrive at random on any spin in the Random Overlay Wild feature. The Barbarian overlay will add a 2×2 square of wilds anywhere on reels 1 through 4. The Priestess and Samurai overlays can put between 2 and 5 added wilds into play. A new payout is made with the new wilds in place. There are also a trio of scatters, each 1 featuring the standard of 1 of the 3 warlords. Land 2 scatters and you’ll be given a shot at triggering the free spins via the Re-Spin feature. Before the re-spins begin, the scatters will go into battle and transform into the same symbol which determines which of the 3 free spins feature you’ll trigger if you do land them. Barbarian Free Spins feature – here you’ll be awarded a minimum of 9 free spins. These are played out with the lower value battle mask symbols removed from the reels. Any barbarian scatters that land during this round will add an extra three spins to your tally. There’s up to 600 times your stake to be won in total. Priestess Free Spins feature – this awards 7 free spins. Every scatter that lands here will increase a multiplier by 1. This is the most lucrative feature with over 6,666 times your stake on offer! Samurai Free Spins feature – 5 free spins are awarded here. Every scatter that lands will turn into a sticky wild which will remain in place for the duration of the feature. As for the Barbarian, you can win 600 times your bet in total. Warlords: Crystals of Power looks pretty complicated on first view. Just see the scatters and re-spins as a stepping stone to landing the free spins. Once you’ve triggered them, there’s plenty to like courtesy of the modifier extras. The overlay wilds help things tick over in the base game too. Well-designed as we’ve come to expect from NetEnt and boasting a decent selection of feature, Warlords: Crystals of Power is an entertaining game and one worth investigating if you’re a fan of the swords and sorcery theme.